You are here: Home ∼ Chinese Breeze ∼ Chinese Breeze Level 1 ∼ Level 1: Wrong, Wrong, Wrong! 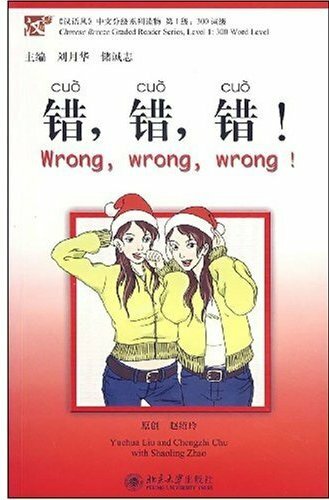 Wrong, Wrong, Wrong! is in the first level of Chinese Breeze which contains approximately 300 words. Description of the book: June 8. Beijing. A pretty girl lies dead on the floor of her luxury home. A slip of paper found on her body reads, “I am tired. Let me leave…” At the bottom of the slip is a signature: Lin Shuang-shuang. Shuang-shuang has a twin-sister called Dui-dui. The two girls look so similar that others can hardly tell who’s who. Is the one who died really Shuang-shuang? Then where is Dui-dui? If the one who died is Dui-dui as someone claimed, then why is the signature on the slip Lin Shuang-shuang?